ANOTHER 140 jobs are to be lost at the country’s only potash mine, in the North York Moors National Park. Owner ICL UK said the decision to reduce production at the Boulby mine, near Staithes, reflected the “continuing decline” in potash prices. In April this year, seven miners were rescued by the underground rescue unit after a fire broke out at Boulby Mine. The latest job losses come on top of 220 redundancies and the removal of 140 contractor posts announced last November. But ICL insisted the site was still viable, and has applied to extend its licence to mine at Boulby for another 40 years, by switching from potash to the extraction of another fertiliser, Polysulphate. Its current licence runs out in 2023, and an extension requires approval from the North York Moors Park Authority. Peter Smith, the firm’s executive vice president for potash, said the Boulby plant would be “restructured” around the extraction of Polysulphate, while its limited remaining reserves of potash would continue to be mined at a reduced rate until exhausted. Mr Smith said the company was developing a range of fertiliser products based on Polysulphate, as well as a compacted potash and Polysulphate product to be marketed as Potashplus. Redcar’s Labour MP Anna Turley called the latest job losses “disappointing news for the local economy”. However, Ms Turley said the planned Teesport Renewable Energy Plant near Middlesbrough, and a projected £2.4bn potash mine to be built near Whitby by Sirius Minerals, would both create new job opportunities in the area. Boulby, which employs around 1,000 people, has been hit by a series of tragedies since last November’s redundancies. In June, a worker was killed in an underground explosion while the plant was on a state of alert over possible gas escapes. John Anderson, 56, died when a sudden release of gas occurred in the section where he was working. 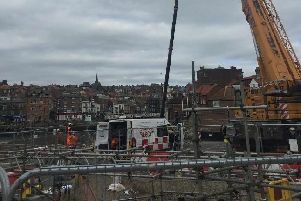 Two weeks ago, a contractor was airlifted to hospital after suffering burns in an incident at the site. Four months earlier, seven miners were rescued after a fire broke out in supposedly fire-retardant polystyrene blocks used to circulate air around the mine. And in 2014, the Mines Inspectorate was called in after an underground roof collapse. ICL insisted that safety at the site was a “top priority”. Boulby is the world’s only producer of Polysulphate, which is claimed to be more environmentally friendly than other fertilisers and contains four plant nutrients of sulphur, potassium, magnesium and calcium.